The M&E Officer is a self-motivated individual who will set and analyze data and monitor achievements of project targets and goals. He/She will work in close collaboration with the project team members in receiving and analyzing laboratory data and monitor performance. Project Finance and Administration officer will be working under the direct supervision of Senior Finance Manager in close collaboration with the Laboratory Service Manager. He/She will be responsible with providing critical support and guidance to the pool of project staff at head office and zonal offices primarily on administrative and as well as general finance matters on day to day basis.  Ensuring that all payment vouchers are complete with all the necessary support documentation such as pro-forma invoices/bids, local purchase order, selection minutes, delivery notes, tax invoices, etc. before making payment.  Timely procurement of project materials, services, supplies and update of inventory register.  Posting of transactions, management of advance payments and financial report production.  Reviews, analyses, researches and recommends to the management on cost cut and cost savings strategies in order to realize more targets and increase operational efficiency.  Accurate and timely preparation of monthly Bank reconciliation statements.  Acting as a key liaison with field offices in timely collection of various documents from field offices, compiling them in a manner that facilitates timely payment.  Managing the payment complaints register by making following up of failed mobile money transactions and reporting progress to the senior Finance Manager.  Coordinate all logistics and preparations of trainings/meetings/events.  At least 3 years work experience in similar or related field in NGO setting. To provide effective transport facilitation to Project staff in order to attain the objectives of the organization.  To facilitate transpiration of project staff using the assigned vehicle.  To ensure cleanliness of assigned vehicle at all times when in use or otherwise and that the vehicle is in good condition before use.  To carry out periodic checks on the assigned vehicle to determine maintenance needs and report accordingly and time.  To drive carefully at all times and ensure safety of the passengers, other road users and the assigned vehicle.  To keep up to date vehicle mileage log.  To indicate the vehicle fuel and service costs.  To ensure all vehicle reports are done on a selected basis and submitted on or before the scheduled date.  To assist in other duties in the office as assigned by the immediate supervisor when not undertaking transport facilitation.  Must be flexible and able to adapt to abrupt changes in Project at short notices.  Any other work duty assigned by the Transport Officer/Site Manager.  A minimum of two (2) years of experience in driving 4WD vehicles. 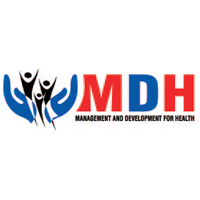 Management and Development for Health (MDH) is a non-profit organization in Tanzania contributing to address public health priorities. MDH works with the Ministry of Health, Community Development, Gender, Elderly and Children; as well as academic and nonacademic institutions to address the problems of Tuberculosis, Malaria, HIV/AIDS, Nutrition, Maternal and Child Health and to undertake initiatives to advance public health research, education, and services for improving the lives of people. MDH supports the Government of Tanzania through the Municipal councils of Ilala, Temeke, Kinondoni, Ubungo and Kigamboni in implementation of the program on HIV/AIDS Care and Treatment and monitoring of people living with HIV/AIDS (PLWHA). In order to strengthen the care and treatment of PLWHA in Dar es Salaam, MDH on behalf of Ilala Municipal Council seeks to employ the following staff for short contract ending 30th September, 2018. The Clinician should be a holder of Diploma, Advance Diploma and/or Bachelor in Clinical Medicine from a recognized institution; he/she should have an experience of at least 3 years in the field of expertise. e-mail hr@mdh-tz.org or dropped by hand at the MDH Head Office at Mikocheni, along Mwai Kibaki Road, Plot No. 802. Kindly note that only shortlisted applicants will be contacted.